Male haddock are vocal during the spawning season. This image shows the termination of courtship, with the male haddock mounting the larger female before the fish release eggs and sperm simultaneously into the water. Image credit: Anthony Hawkins, Loughine Ltd. The haddock (Melanogrammus aeglefinus) is a commercially important, bottom-dwelling groundfish found in marine waters of the North Atlantic. They occupy waters at depths of 50 to 250 m (164-820 ft). Haddock have a purple-grey back and head, a distinct, uninterrupted, black lateral line, and a characteristic dark blotch above the pectoral fin, often described as a “thumbprint.” They range in size between 38-69 cm (15- 27 in) in length and 0.9 to 1.8 kg (2-4 lbs) in weight. As bottom-dwellers, haddock feed primarily on crustaceans, worms, mollusks, echinoderms, and some fishes. Male haddock are especially vocal during the spawning season, which occurs between January and June. Characteristic sounds are described as “knocks” and “hums,” the main frequencies of which are below 600 Hz. The predominant frequencies differ with the size of the fish, with larger haddock producing sounds containing lower frequencies. The haddock produce these sounds through the contraction of specialized drumming muscles attached to their swim bladder. The drumming muscles of haddock are larger in males than females, and are greatly enlarged during the spawning season, increasing to almost double their normal size. Male haddock produce distinct acoustic signals associated with particular parts of their courtship displays. During the “solitary display,” a male haddock positions itself at a particular location and patrols this territory in tight circles for many hours. During the display, calls consisting of long sequences (lasting several minutes) of low frequency knocks are repeated, with regular inter-knock intervals of 60 and 140 ms. Each knock is composed of two, short, low frequency pulses, repeated in quick succession. The calls become longer and the knocks within them are produced at a faster rate as the level of courtship increases, with the repetition of knocks occurring so quickly (intervals as short as 30 ms) that they sound like a hum. Multiple male haddock will call during the spawning period, and their collective calls create a low rumble. This low-frequency rumble often occurs at night, with a spectrum from 30-400 Hz and an average sound level 12 dB above the daytime level. Knocking rates, call durations, and the structure of the individual knocks differ among individual males, making their vocalizations distinguishable. It is not known if female fish, however, can distinguish individual males based on their calls. 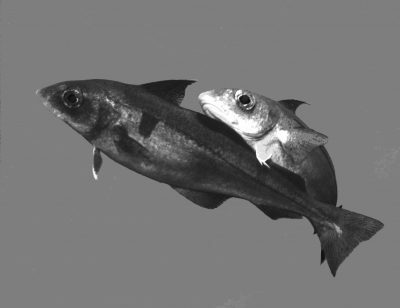 Scientists hypothesize that the calls may function to establish dominance among other males, attract female haddock, convey information on the characteristics of the individual male emitting the sounds, synchronize reproductive behaviors, and/or compete with other males for mating opportunities. Outside the spawning season males also produce sounds during agonistic encounters with other males. However, the knocks within the calls outside the spawningseason differ in structure from the knocks exhibited during spawning. Female haddock produce sounds, which are also described as double-pulsed knocks. Like knocks produced by males, these sounds are composed of different frequencies, with the first pulse having a higher frequency than the second. However, in contrast to male knocks, the second pulse is higher in amplitude than the first. Given the species and gender specific nature of haddock vocalizations, passive acoustic surveys provide an effective tool to locate and study spawning aggregations of this fish species. Fisheries and Oceans Canada, Haddock. Gulf of Maine Research Institute (GOMRI), Haddock.